It is still part of your house even if outside: the patio becomes the center of your home as soon as summer comes. Everyone enjoys spending a day out in the patio, or having a drink at the terrace of a bar when the sun comes out. In order to transform your outdoors into a pleasant place, it has become essential to arrange it with well-designed, elegant and resistant furniture. If you own a hotel, bar, restaurant, café or nightclub, you should in no case neglect your terrace: it attracts bystanders at first glance during the summer! It highlights the identity of your establishment. To make it attractive, you can bet on original, comfortable, but most of all easy-care furniture, especially made to withstand various climate conditions. It is the same for the arrangement of your private patio or garden. Do you wish to create a relaxing place, somewhere you can recharge your positive energy, read, daydream, and share happy moments with your family and friends? Do you want to give a unique charm to your outdoors? 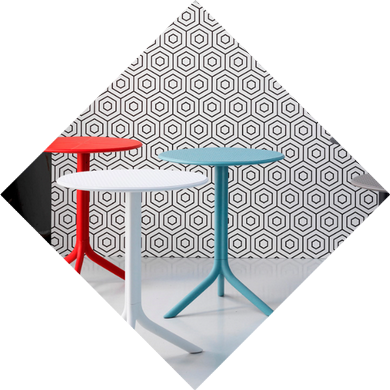 Play with the colors, materials and shapes of your tables, chairs, benches, lounge furniture and lightings to create the atmosphere you want. 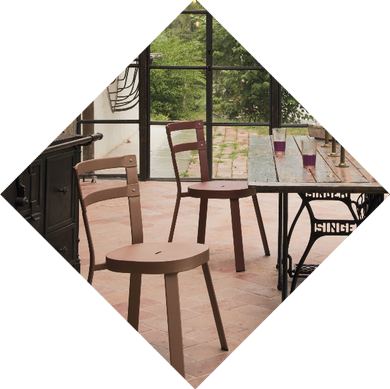 In order to choose wisely the arrangement of your terrace or patio, aDesign, suggests you many varieties of outdoor furniture, made with materials that can withstand any kind of weather, and easy to maintain: wood, metal, plastic, polypropylene or polyrattan…there is something for everyone’s taste! We will guide you in your project. Whether you wish to arrange your home’s outdoors, or your establishment’s terrace, create with us a place that will suit you best. 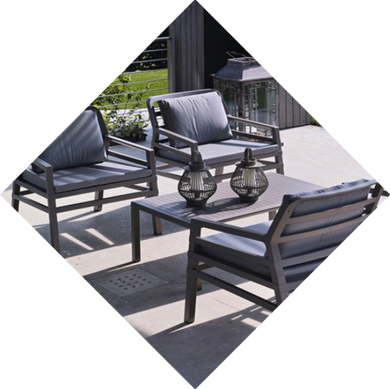 On our website, you can discover our various ranges of outdoor furniture. Made your choice? Contact us as soon as possible to take it to the next step!